The use of a powerful class of antibiotics called carbapenems has increased dramatically in the United States over the past five years, a new study shows. The increased use of these drugs -- widely regarded as the last option for treating severe infections caused by multidrug-resistant bacteria -- is cause for concern because carbapenem-resistant bacteria are becoming more common, the researchers said. Overuse of carbapenem drugs could lead to the reduction of their effectiveness against tough-to-treat infections. For this study, the researchers analyzed antibiotic use in 110 VA facilities from 2005 to 2009. 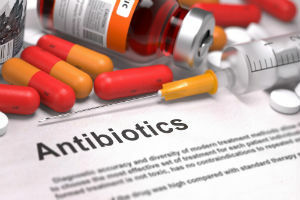 They found a gradual rise in overall antibiotic use, but major increases in the use of certain types of antibiotics: carbapenems (102 percent); intravenous vancomycin (79 percent); and combinations of penicillin with beta-lactamase-inhibitors (41 percent). The investigators also found that fluoroquinolones were the most frequently used class across all the VA facilities, accounting for 20 percent of all antibiotic use. The study was to be presented Sunday at the Society for Healthcare Epidemiology of America (SHEA) annual meeting, in Dallas. "Use of these antibiotics helps the patient receiving the treatment, but has future consequences for innocent bystanders. The more these drugs are used, the more resistance we see," study author Dr. Makoto Jones said in a society news release. "In this era of multidrug-resistant organisms, clinicians are placed in a difficult situation," Dr. Steven Gordon, SHEA president, said in the news release. "As treatment outcomes of many bacterial infections are influenced by the timing of appropriate therapy, the increasing presence of resistant organisms triggers broader use of these powerful antibiotics for proven or suspected infections when treating patients in the hospital." Gordon added that doctors "must always put the patient first in treatment decisions but we must empower effective antibiotic stewardship programs, infection prevention and control efforts, the development of new diagnostic testing to facilitate better treatment decisions as well as support development of new antibiotics." The U.S. Centers for Disease Control and Prevention has more about antibiotics.